Grove Cemetery is located on the east side of Route 395, .2 of a mile down from Quaker Street. A long curved roadway leads to the cemetery from Route 395. The Association which is responsible for the care and maintenance of the cemetery is a not-for-profit organization with a Board of Trustees, comprised of lot owners, and a Superintendent. The following persons met in the office of Dr. J.H. Hill, Quaker Street, NY October 23, 1873 and organized under the Statute Law, the Grove Cemetery Association: Alonzo Macomber, Kirby Wilber, John H. Hill, DeWitt D. McDonald, Hebron W. Briggs, Nathaniel C. Jenkins, Samuel B. Davenport, Charles B. Davenport, Jesse B. Carpenter and Smith White. Land was conveyed for the cemetery by Eliza and Lizzie Sheldon on November 22, 1873 and by Oliver and Eve Ann Briggs on Nov. 28, 1873. The northern piece of land which we refer to as Section 1 was accessible by a roadway which is 500 feet downhill from the present entrance. In 1879 a receiving vault was built on this road. It is a 12 foot by 14 foot brick building with a steel door which was used for storing the deceased when winter burials were not possible. It was used until the late 1950s with the slate roof replaced by a metal roof in the 1960s to help preserve the building. The Potters’ field was a piece of land east of Section 2 set aside for indigent burials. These graves were marked by field stones or blank pieces of marble. A new entrance was built to access Section 2. It was behind the barn on the south side of the cemetery property. 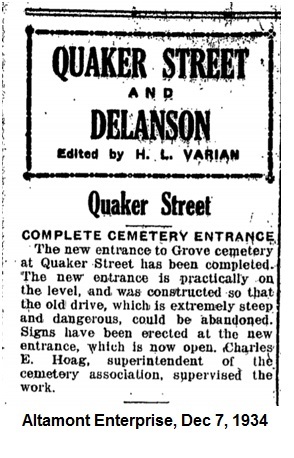 This entrance was satisfactory with horses but it was difficult for automobiles since it was steep coming up off of Quaker Street Hill (Route 395). 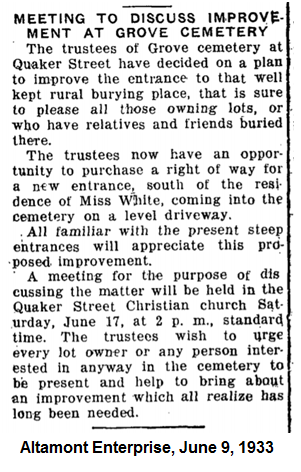 In early June of 1933, the Trustees of Grove Cemetery met to discuss the purchase of the White property in order to build a new entrance to the cemetery. By the end of June 1933, at a special meeting of the Trustees, permission was granted to acquire the land for the entrance. Alice White conveyed land on October 10, 1933 so that a new entrance (the present entrance) could be built, thus solving the problem of accessibility to the auto. 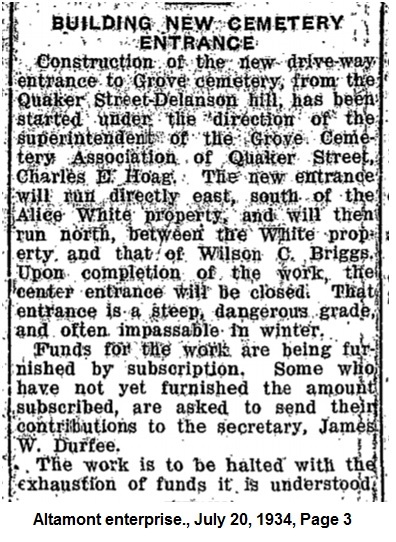 In July of 1934, construction of the new entrance was started and supervised by Charles E. Hoag who was the superintendent of the Grove Cemetery Association at the time. The new entrance was completed by December of 1934. 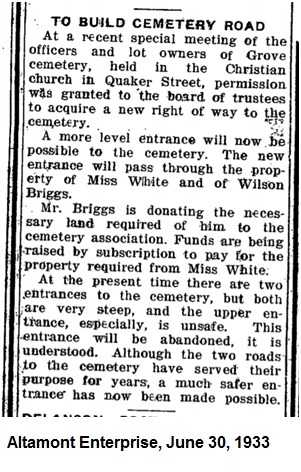 On May 27, 1914 and October 10, 1933 Wilson C. Briggs conveyed land at the eastern edge of the cemetery which became Section 3. The cemetery has continued to expand through the years. In 1984 three acres of land was purchased from Gibby Wolfe this area we refer to as Section 4. Due to the increasing number of cremations, the Urn Garden was dedicated in 1998 for the burial of cremains. Interestingly, despite the cemetery being formed in 1873, the earliest date of death on a monument is 1854. That is because some deceased were moved from the Quaker Cemetery and others from family cemeteries. Many graves do not have markers due to no survivors or perhaps lack of money. Unfortunately, there was a fire in the 1930’s that destroyed many of the burial records. Consequently, we don’t have a complete listing of those people buried here before 1930, but slowly we are finding the information that was lost. The Grove Cemetery has been a part of the community since 1873 with over 2500 burials. With guidance from our Board of Trustees and help from our families, we will continue to thrive and grow.